My husband recently sent this letter to many friends and family. I thought it was excellent and wanted to post it (with his permission). This article below pretty much sums up (from a historical perspective) why I believe Ron Paul's vision for America is the right one in 2008 and beyond. I realize that Congressman Paul's chances are minimal at best to even have a chance at winning his party's nomination this year, and that the current political hype is all about form and no substance (i.e. how candidates look, act, stand, cry, fundraise, play guitar, and cozy up to celebrities). Watching the political process as I have over the past few months, I must come to the conclusion that if Thomas Jefferson were to run for President in 2008, he would be treated the same way Ron Paul has been treated throughout this entire process - shunned from debates (thanks to Fox News), made fun of by pundits, slandered by the neoconservatives, laughed at by the other candidates and pushed to the fringes by the elites that think they know better than "we the people.". Jefferson wouldn't even be recognized by many in our age. His ideas would fall on deaf ears and most would think him strange at best. With that said, I must confess that I'm not in the least bit depressed. In almost 20 years of political "activism," this is the first time I have felt totally confident in where I stand and who I stand for in the political process. Sure, I've realized along the way that someone of Ron Paul's strong character, consistent record and "radical" ideas probably won't win and that the media and the two-party system will force out those who speak the truth. But, I guess I'm optimistic because I've realized that this movement has finally gotten its voice and this message is being sent out all over the Internet and the airwaves through debates, radio, TV and print commercials, and articles such as this. Movements take a long time to gain traction, and I believe this is starting to happen with the message of personal liberty and freedom in our country. Make no mistake, the Clintons are not the only or even the biggest threat to our freedoms. George W. Bush has caused this movement to really awaken and neoconservatives and big government proponents such as Huckabee, McCain, Romney and Guiliani are the "me toos" of George W. Bush and the Clintons. They may all talk about morals, freedom, equality and limited government, but they are ultimately addicted to government and its alluring benefits. Don't be fooled - this is a game of influence, money, fame and ultimately power. Thomas Jefferson had no such objective. His was to free the states from the tyrannical power of a centralized government and bring it back to the people. Through history, we can see that when we followed that plan, it has worked. At this election season, I am allowing for a little historical perspective in the race for the White House. So, I hope you enjoy this article as much as I have. Here is the article to which he referred. BTW, did you know our youngest son's name is Jefferson?! Wonderful article. I couldn't agree more. Often times the real message of hope--liberty and justice (hrmm, who does that sound like?!) is lost in catch phrases and insincerity. Dr. Paul stands out from the other candidates because of his consistency and morals. I've never known such a moral politician, and I've been involved in politics for years. It's inspiring, and again, gives me hope. One of my favourite things about Dr. Paul is that even if I don't agree with every stance (although I do agree with most) I at least know exactly where he stands and how he would vote. He doesn't talk out of both sides of his mouth, or seek to pander just for votes. He stands for something, and actually knows why he stands for it. Good article, thank you for posting it. 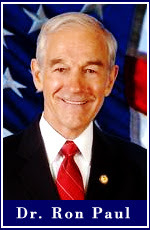 We agree with many of Ron Paul's positions, and would gladly welcome much of the change that he stands for. However, I am married to a United States Marine who will not vote for Paul because of his positions on foreign policy. Jessica, I understand that Ron Paul's position on foreign policy is not mainstream. However, I do believe it is constitutional. Did you know that he is the most supported candidate (measured by monetary contributions to the candidate's campaign) by active duty military personnel? I found that quite interesting! My brother is currently serving actively in the army as a Ranger, so I do understand the military connection. Ron Paul's foreign policy is one that we wholeheartedly agree with! On the topic of Thomas Jefferson, is it truly possible to compare his foreign policy with Ron Paul's, when Jefferson had no way of predicting the future magnitude of the global economy, the dependency on oil from the Middle East (we, of course, wish this were not so), the weapons of mass destruction, etc? I understand that this current war in Iraq was not declared by Congress (although, they did authorize the use of military force against Iraq- ugh, politicians!) but our views on the war are far different from Paul's on many levels. "There is no convincing evidence that Iraq is capable of threatening the security of this country, and, therefore, very little reason, if any, to pursue a war." "For more than a thousand years there has been a doctrine and Christian definition of what a just war is all about. I think this effort and this plan to go to war comes up short of that doctrine." "In summary, there are three kinds of war that are just: (1) wars of defense against aggression; (2) wars to help and defend an ally or weaker nation from aggression; (3) civil wars to overthrow rank tyranny and oppression by the rulers or to put down evil insurrection." Which brings me to this thought: This verse has been on my mind the last day or two- "...For unto whomsoever much is given, of him shall be much required..." from Luke 12:48. God has allowed the United States a great deal of power, in fact, we are the strongest nation on His created earth. Do we not have an obligation to intervene to protect the innocent in regions where evil reigns? I know that many would say we cannot possibly fight all of the world's wars, and, yet, is that a logical argument for saying that we should then not get involved at all? I am not trying to be adversarial! p.s.- we do agree with Paul on the matter of the U.S. getting out of the U.N.! !